Have you seen this man? 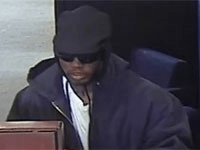 Suspected in four recent bank robberies in the Denver area, he is described as a black male in his 30s, 5'9" to 6'0" in height, with a slender build. Authorities say he is known to conjugate and may also use semicolons correctly. According to an FBI press release issued Monday (thanks, Mark), its local task force has dubbed this man the "Good Grammar Bandit" because "the demand notes presented by this individual to the victim tellers are typed with proper spelling, grammar, and punctuation." For now the FBI is refusing to release the letters on the grounds that they are "evidence in the investigation," though I suspect it is actually delaying the release so a team of FBI grammarians can complete a full analysis. It would be embarrassing to have missed something obvious like an error in hyphenation or something. I will admit to having just looked at the rules on hyphenation because I was tempted to make fun of the FBI for not hyphenating "Good Grammar Bandit." My first reaction was that "Good Grammar" should be hyphenated because it is a compound adjective, but the rule appears to be that you don't hyphenate the adjective if it's a proper noun ("Brooks Brothers suit"). Here, though, all three words are part of the same proper noun…. Bottom line is, I'm not making fun of the FBI on this one. I guess we can infer from the nickname that most demand notes today are poorly written, although I couldn't find any examples of that in my own database, somewhat surprisingly. There was this guy who, if he was trying to rob the bank, was unable to communicate that in any way at all, but to be honest I don't know what the hell he was doing. I know there have been incomprehensible-note cases (not the same as "incomprehensible note cases," by the way), but I'm apparently more amused by bad disguises.